North Korea has ended co-operation with UN nuclear inspectors and ordered them to leave the country, the International Atomic Energy Agency says. Pyongyang told the IAEA to remove seals and equipment from the Yongbyon reactor and said that it would reactivate its nuclear facilities, the watchdog said. The White House called on Pyongyang to stop its "provocative threats". Russia and China have asked it to reconsider. The row concerns North Korea's launch of a long-range rocket on 5 April. North Korea is angry about a UN statement condemning the launch, which it says was aimed at putting a communications satellite in orbit. But other nations believe it was testing long-range missile technology, in violation of a UN resolution banning Pyongyang from ballistic missile development. The communist nation also says it is pulling out of talks on ending its nuclear programme. In a statement, the UN watchdog said North Korea had served notice that it would cease co-operation immediately. Jan 2009 - The North says it is scrapping all military and political deals with the South, accusing it of "hostile intent"
"It [the North] has requested the removal of all containment and surveillance equipment, following which, IAEA inspectors will no longer be provided access to the facility," the statement said. "The inspectors have also been asked to leave... [North Korea] at the earliest possible time." In a strongly worded response, White House spokesman Robert Gibbs called on North Korea "to cease its provocative threats and to respect the will of the international community and to honour its international commitments and obligations. He called the North Korean pledges to withdraw from long-running six-party talks and restart its nuclear programme "a serious step in the wrong direction". He defended the UN Security Council statement condemning the rocket launch. Earlier, Secretary of State Hillary Clinton called the North's move "unnecessary" and said she was hoping for opportunities for dialogue instead. IAEA inspectors went to North Korea following the landmark February 2007 deal, under which it agreed to end its nuclear ambitions in return for aid and political incentives. Some progress was made - last year North Korea partially disabled its Yongbyon reactor and handed over what it said was a complete declaration of its nuclear activities. But talks have stalled in recent months, as Washington and Pyongyang accused each other of failing to meet obligations. Hours after the UN Security Council issued a statement condemning its rocket launch on Monday, North Korea announced it was pulling out of talks - with the US, China, Russia, South Korea and Japan - on the deal. "We will never again take part in such talks and will not be bound by any agreement reached at the talks," a foreign ministry statement said. China and Russia - the North's neighbours and closest allies - have urged North Korea to reconsider its decision, with Beijing calling for "calm and restraint". Analysts say the action from North Korea appears to be an attempt to test the Obama administration and to force it to make fresh concessions. 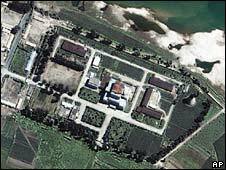 North Korea carried out a nuclear test in October 2006.